Forests were front-and-center in the global war on climate-change this year, as we saw when the Paris talks ended in universal agreement on mechanisms for saving forests to slow global warming. Corporate actions, however, haven’t yet matched their pledges, and illegal deforestation continues to ravage forests. Here’s a look back at some of our forest coverage from 2015. 31 December 2015 | The warmest year on record is drawing to a close with a flurry of good intentions and bad actions. On the “good” front, negotiators in Paris agreed to slow climate-change in part by saving forests. On the “bad” front, we’ve just learned that China’s demand for rosewood is fueling illegal timber trade across Africa and Asia – reminding us again that even the stunning Paris Climate Accord won’t mean a thing if we don’t enforce laws already on the books and hold leaders accountable for their promises they already made. In hindsight, it’s clear that 2015 was a year of old promises kept and new promises made – but also of old promises broken and new loopholes opened. Nowhere is the paradox more clear than in forest finance. Governments Put Money on the Table – but for What? In 2015, governments stepped up with billions in pledges and payments to slow deforestation – but they’re also pouring hundreds of billions into agricultural subsidies that often support exactly the kinds of activities that are killing the trees. Indeed, the Overseas Development Institute this year found that governments spend at least $486 billion on agricultural subsidies every year, dwarfing all funds earmarked to slow deforestation – and that doesn’t include the money spent to subsidize fossil fuels. 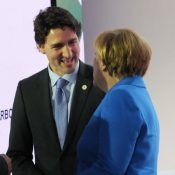 He made similar comments alongside the heads of state of Canada, Chile, Ethiopia, France, Germany, and Mexico – each of whom spoke glowingly (and surprisingly knowingly) of the need to put a price on carbon. A global price on carbon is years away, but national cap-and-trade programs are proliferating, and governments are stepping up with funding to save forests and pave the way for market-based payments that drive down industrial emissions. It’s a development made possible because negotiators agreed on rules for measuring, reporting, and verifying changes in the amount of carbon stored in the world’s forests under a set of decisions known as “REDD+” (Reducing Emissions from Deforestation and Degradation of forests, plus effective management of land). Indeed, the REDD Early Movers program used the Paris talks to announce that they were making good on a $100 million pledge to end deforestation in Colombia, while governments around the world put money on the table to save forests. The REDD+ agreement didn’t magically emerge in Paris, but had in fact been evolving for almost a decade, and that evolution accelerated in the last two years. By June of this year, negotiators had already resolved all the contentious issues surrounding REDD+ except one: how to treat market mechanisms. Thus, even by the middle of the year, it was clear that forests would be central in this year’s agreement. Corporates Promise Much; But Will They Deliver? Historically, the private sector has been a mixed bag: hundreds of companies around the world have promised to eliminate deforestation from their supply chains, but only a few have actually made good on even some of their promises. Meanwhile, evidence grew this year that commercial agriculture – particularly related to palm oil, soy, cattle, timber, and pulp and paper – is the leading driver of tropical deforestation. At least two NGOs launched programs this year to light fires under corporate butts by shining a light on who’s good and who’s bad. The Global Canopy Programme’s Forest 500, for example, identifies the 500 entities that have the greatest impact on forests, and it ranks them according to their pledges. Ecosystem Marketplace’s Supply Change then looks at those private-sector companies that made pledges and tracks their progress in real time, while organizations like the Innovation Forum have been conducting workshops for businesses that say they want to tackle deforestation but don’t know how. Not surprisingly, those companies that have already kept their promises are now clearing a path for other companies to do the same – in part by promoting efforts to use REDD+ finance to create zero-deforestation counties and states in developing countries. The biggest boost to corporate action this year came not form good intentions, but from investors who dumped fossil-fuel shares after realizing the oil companies had created a “climate bubble” by treating their oil and coal still in the ground as an asset in a world that’s trying like hell to move away from fossil fuels. That led former New York Mayor Michael Bloomberg to take over a task force that identifies and quantifies climate risk. In 2015, we learned that 2014 was a record-breaking year for forest carbon finance as payments for emissions reductions reached $257 million, amounting to nearly 34 million metric tons of avoided emissions, according to Ecosystem Marketplace’s report, “Converging at the Crossroads: State of Forest Carbon Finance in 2015”, which showed that voluntary buyers had spent nearly $4.5 billion on offsets over the past decade. Initiatives aimed a capturing private-sector finance continued to proliferate, with the Fairtrade Climate Standard officially launching at the Paris climate talks. But the big money over the next few years is expected to flow from governments to other governments – with private-sector involvement focused more on eliminating deforestation from corporate supply chains than on direct offsetting. Indigenous people and traditional communities are among the best stewards of the land, but their impact is often unappreciated, while their tenure is tenuous at best. To press the issue into the open, the World Resources Institute and 13 partners this year launched an interactive platform that lets users map the relationship of people and their land. In the early 1990s, environmentalists started experimenting with carbon finance to support conservation just as indigenous people of the Amazon began developing “Life Plans” to revive and support their traditions. In 2015, these two parallel initiatives began to converge as some indigenous organizations started pushing for what they called “Indigenous REDD”. By June, the Amazon’s largest federation of indigenous organizations had begun advocating for the creation of an indigenous fund to handle climate finance. Over the past decade, Brazil has managed to reduce its greenhouse gas emissions by slowing deforestation – but its deforestation rates jumped 16% in the year ending in August. On the eve of the Paris talks, the country’s climate action plan promised to accelerate the use of renewable energy and green agriculture, but the federal government reiterated its longstanding aversion to accepting market-based payments for reducing emissions from deforestation and degradation. The move doesn’t stop anyone from abroad from buying offsets voluntarily, but it means that countries that fund forest protection in Brazil can’t use results to reduce their own carbon footprint. This, not surprisingly, widened an old rift between the federal government and the state governors, with governors demanding the right to accept and account for market-based payments from abroad in order to continue their fight against deforestation. Indonesia took a similar stance, and surprised the environmental community earlier this year when its climate action plan shifted away from saving forests and towards ramping up clean energy. But then its forests started burning, and in Paris the country showed signs that forests and ecosystem restoration will play a larger role in the country’s climate strategy. Carbon finance has been slow to flow to Africa, but that may be changing. The Democratic Republic of Congo, for example, is enjoying a tenuous peace – which has made the forests safe for illegal palm oil plantations. The country is now exploring ways of using carbon finance to stifle the activity. Ghana, meanwhile, is seeing a threat to its largest cash crop, cacao, as farmers burn through land and devour forests. The government hopes to fix that by using REDD+ finance to promote sustainable agriculture, provide insurance, and help those who embrace sustainable farming to sell their products. For now, however, most African climate action is focused on individual projects, like the one the Hadza hunter-gatherer people of northern Tanzania launched in the Yaeda Valley. First, they had to do something they’d never done before: secure rights to the land they had been inhabiting for for 40,000 years. As we enter the new year, we do so with unprecedented global agreement on how to fix the climate mess. The challenge now isn’t to develop newer and more innovative solutions, but to implement the time-tested solutions that already exist. That, however, could be our greatest challenge yet.